The Golgi apparatus is an organelle found in most eukaryotic cells that is involved in important processing functions, including the sorting and modification of newly synthesized proteins as part of the secretory pathway; carbohydrate synthesis and modification; sulfation of certain molecules; and synthesis and transport of certain lipids. Also known as the Golgi body or Golgi complex, this cellular structure is composed of flattened membrane-bound compartments (cisternae) typically organized into stacks. It was identified in 1898, by Italian physician Camillo Golgi and named after him. It also known as dictyosome. The Golgi apparatus forms a part of the endomembrane system of eukaryotic cells. Its primary function is to process and package macromolecules such as proteins and lipids that are synthesized by the cell. It is particularly important in the processing of proteins for secretion, whether for functions outside the cell or intracellular (such as to lysosomes). The complexity and precision of the Golgi apparatus is remarkable, involving modification of substances by enzymes, proteins being labeled with signal sequences, transporting and sorting of proteins through the various functional regions of the Golgi apparatus, and so forth. And this is just one of numerous complex and finely tuned activities taking place continually in a eukaryote cell, which is also involved in production of proteins, replication of genes, production of ATP, and so forth. The Golgi apparatus is composed of membrane-bound, cup-shaped stacks known as cisternae. A typical Golgi apparatus may have anywhere from six to eight cisternae stacked upon each other like a stack of dinner plates, or deflated balloons, but many more have been observed. As many as sixty may be found in some unicellular flagellates combined to make up the Golgi apparatus, and animal cells often contain ten to twenty Golgi stacks per cell, with tubular connections between cisternae making them a single complex (Davidson 2004). The cisternae carry enzymes to help or to modify cargo proteins traveling through them destined for other parts of the cell. The cisternae also carry structural proteins important for its maintenance as a flattened membrane and its stacking upon each other. The cisternae stack has five functional regions: The cis-Golgi network, cis-Golgi, medial-Golgi, trans-Golgi, and trans-Golgi network. The earliest cisternae also are called the cis-cisternae, followed by the medial cisternae, then the trans-cisternae, as they move away from the endoplasmic reticulum, while the area of the formation of new cisternae is called the cis-Golgi network and the trans-Golgi network refers to the end of the Golgi where transport to other parts of the cell occurs. Both the cis-Golgi network and the trans-Golgi network are thought to be specialized cisternae leading in and out of the Golgi apparatus. Vesicles coming from the endoplasmic reticulum (via the vesicular-tubular cluster) progress through this stack. A vesicle is a small intracellular, membrane-enclosed sac that stores or transports substances. Vesicles fuse with the cis-Golgi network and subsequently progress through the stack of cisternae to the trans-Golgi network, where they are packaged and sent to the required destination. Each region of the Golgi apparatus contains different enzymes, which selectively modify the contents depending on where they are destined to reside (Lodish et al. 2004). The trans face of the trans-Golgi network is the face from which vesicles leave the Golgi. 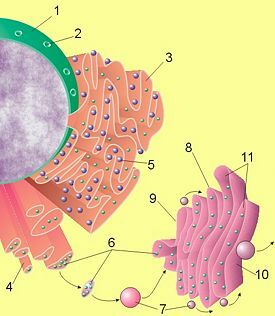 These vesicles then proceed to later compartments such as the cell surface (or plasma membrane), secretory vesicles, or late endosomes. Cells synthesize a large number of different macromolecules required for life. The Golgi apparatus is integral in modifying, sorting, and packaging these substances for cell secretion (exocytosis) or for use within the cell. It primarily modifies and sorts proteins delivered from the rough endoplasmic reticulum but it is also involved in the transport of lipids around the cell, and the creation of lysosomes. In this respect, it can be thought of as similar to a post office; it packages and labels items and then sends them to different parts of the cell. Enzymes within the cisternae are able to modify substances by the addition of carbohydrates (glycosylation) and phosphates (phosphorylation). In order to do so, the Golgi transports substances such as nucleotide sugars into the organelle from the cytosol. Proteins also are labeled with a signal sequence of molecules, which determine their final destination. For example, the Golgi apparatus adds a mannose-6-phosphate label to proteins destined for lysosomes. The Golgi also plays an important role in the synthesis of proteoglycans, molecules present in the extracellular matrix of animals, and it is a major site of carbohydrate synthesis (Alberts 2002). Included is the productions of glycosaminoglycans or GAGs, long unbranched polysaccharides that the Golgi then attaches to a protein synthesized in the endoplasmic reticulum to form the proteoglycan (Pyrdz and Dalan 2000). Enzymes in the Golgi will polymerize several of these GAGs via a xylose link onto the core protein. Another task of the Golgi involves the sulfation of certain molecules passing through its lumen via sulphotranferases that gain their sulfur molecule from a donor called PAPs. This process occurs on the GAGs of proteoglycans as well as on the core protein. The level of sulfation is very important to the proteoglycans' signaling abilities as well as giving the proteoglycan its overall negative charge (Alberts et al. 2002). The Golgi is also capable of phosphorylating molecules. To do so it transports ATP into the lumen (Capasso et al. 1989). The Golgi itself contains resident kinases, such as casein kinase 1 and casein kinase 2. One molecule that is phosphorylated in the Golgi is Apolipoprotein, which forms a molecule known as VLDL, which is a constitute of blood serum. It is thought that the phosphorylation of these molecules is important to help aid in their sorting for secretion into the blood serum (Swift 1996). The Golgi also has a putative role in apoptosis (programmed cell death), with several Bcl-2 family members localized there, as well as to the mitochondria. In addition, a newly characterized anti-apoptotic protein, GAAP (Golgi anti-apoptotic protein), which almost exclusively resides in the Golgi, protects cells from apoptosis by an as-yet undefined mechanism (Gubser et al. 2007). 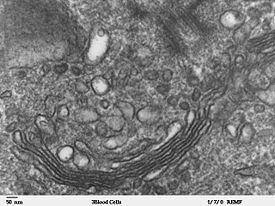 The vesicles that leave the rough endoplasmic reticulum are transported to the cis face of the Golgi apparatus, where they fuse with the Golgi membrane and empty their contents into the lumen. Once inside, they are modified, sorted, and shipped towards their final destination. As such, the Golgi apparatus tends to be more prominent and numerous in cells synthesizing and secreting many substances. Plasma B cells, the antibody-secreting cells of the immune system, have prominent Golgi complexes. The transport mechanism, which proteins use to progress through the Golgi apparatus, is not yet clear; however a number of hypotheses currently exist. Until recently, the vesicular transport mechanism was favored, but now more evidence is coming to light to support cisternal maturation. The two proposed models may actually work in conjunction with each other, rather than being mutually exclusive. This is sometimes referred to as the combined model (Alberts et al. 2002). Cisternal maturation model: The cisternae of the Golgi apparatus move by being built at the cis face and destroyed at the trans face. Vesicles from the endoplasmic reticulum fuse with each other to form a cisterna at the cis face; consequently this cisterna would appear to move through the Golgi stack when a new cisterna is formed at the cis face. This model is supported by the fact that structures larger than the transport vesicles, such as collagen rods, were observed microscopically to progress through the Golgi apparatus (Alberts et al. 2002). This was initially a popular hypothesis, but lost favor in the 1980s. Recently, it has made a comeback, as laboratories at the University of Chicago and the University of Tokyo have been able to use new technology to directly observe Golgi compartments maturing (Glick and Malhotra 1998). Additional evidence comes from the fact that COPI vesicles move in the retrograde direction, transporting ER proteins back to where they belong by recognizing a signal peptide (Pelham and Rothman 2000). Vesicular transport model: Vesicular transport views the Golgi as a very stable organelle, divided into compartments in the cis to trans direction. Membrane bound carriers transported material between the ER and Golgi and the different compartments of the Golgi (Glick 2000). Experimental evidence includes the abundance of small vesicles (known technically as shuttle vesicles) in proximity to the Golgi apparatus. Directionality is achieved by packaging proteins are connected to a membrane via actin filaments to ensure that they fuse with the correct compartment (Alberts et al. 2002). Capasso, J., et al. 1989. Mechanism of phosphorylation in the lumen of the Golgi apparatus. Translocation of adenosine 5'-triphosphate into Golgi vesicles from rat liver and mammary gland. Journal of Biological Chemistry 264(9): 5233-5240. Davidson, M.W. 2004. Molecular expressions cell biology: The Golgi apparatus. The Florida State University. Retrieved July 6, 2008. Glick, B. S. 2000. Organization of the Golgi apparatus. Current Opinion in Cell Biology 12: 450-456. Glick, B. S., and V. Malhotra. 1998. The curious status of the Golgi apparatus. Cell 95: 883–889. Retrieved July 6, 2008. Gubser, C., D. Bergamaschi, M. Hollinshead, X. Lu, F.J. van Kuppeveld, and G.L. Smith. 2007. A new inhibitor of apoptosis from vaccinia virus and eukaryotes. PLoS Pathog. 3(2):e17. Retrieved July 6, 2008. Harris, E., and J. Cardelli. n.d. Golgi. BiologyReference.com. Retrieved July 6, 2008. Lodish, H.F. 2004. Molecular Cell Biology, 5th edition. New York: W.H. Freeman and Co. ISBN 0716743663. Pelham, H.R.B., and J.E. Rothman. 2000. The debate about transport in the Golgi: Two sides of the same coin? Cell 102: 713-719. Pyrdz, K., and K.T. Dalan. 2000. Synthesis and sorting of proteoglycans. Journal of Cell Science 113: 193-205. Spurger, L. 2003. Golgi complex: Structure and function. University of Texas Medical Branch. Retrieved July 6, 2008. Swift, L. L. 1996. Role of the Golgi apparatus in the phosphorylation of apolipoprotein B. Journal of Biological Chemistry 271(49): 31491-31495. This page was last modified on 22 July 2008, at 19:07.